Television over the past decade has become a medium which grew not only for content, style, execution, and talent but also for the audience reach as well. TV Actors are playing a part in this process, and their increased engagement with brands, social media activities, live events with fans, celebrity guest events and flourishing content based career graphs have landed significant opportunities for advertising gigs for the small screen stars. From Karan Tacker, Erica Fernandes to Pearl V Puri and Helly Shah, all these are just a few stars who have kept up their career graph diverse. They have participated in advertising for others based on their stardom but also participated in brand auditions during the kickstart of their career in this industry. These latest advertising platforms are no longer just for television or ad units we view on websites. These new advertising styles are on all mediums of technology and entertainment platforms, like TV, Instagram, Streaming services, and custom apps. 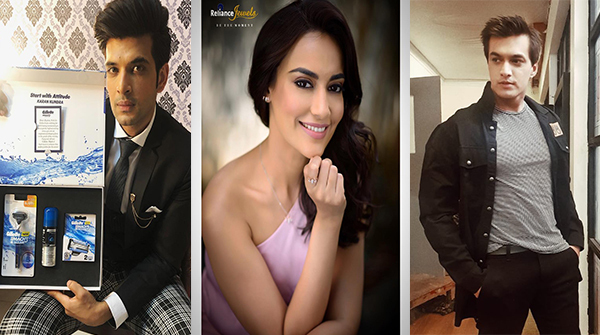 Let’s have a look at the latest ads featuring our most loved TV Actors. Make it special with @thefaceshopindia the MASKIE VDay Kit ! Check stories for the link . Flight and 4-5 hours one way on road… Tiring? Nope! Refreshed seeing this amount of love. Way back to Hyderabad and missing you all #Kalaburgians. #Gulbarga visit album. My Lovelies Which one will you win? FOLLOW @OnePlus_India to be eligible to take this beauty home! HURRY ! FOLLOW NOWWW! Need that soft, supple and glowing skin! . Here's my secret, get yourself hooked to @iloveunloc Day and Night Cream Power Duo Cream and Mixify Skin Glow Serum! ❤️❤️ . Mixify Power Duo Day and Night Cream is non-greasy and works across all seasons and on all skin types! Day Cream is Infused with SPF 50, and for that radiant glow try on the Mixify Glow Serum, I personally choose to mix it night cream. . Totally Loving It!😍 Get yours from Amazon or Nykaa now!!! Nikita Dutta Is Back In MXPlayer Web Series 'Aafat'! Kasautii Zindagii Kay : Let's Take A Moment To Salute Courageous Love!